I saw your perfectly timed post from yesterday... Look at that, a tattered hat. 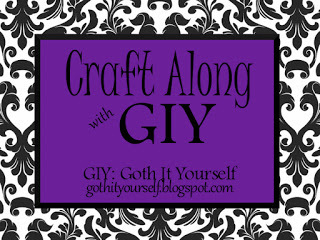 :) I'd like to include it in the March craft-along roundup, if you don't mind. Very cool idea!I love seeing your crafts and really hope to participate this month! Hello, I've completed my project but cannot figure out how to turn the icon into a link!!! I'm also using blogger/blogspot, so could you please help me figure this out? Thanks a con! Insert the icon image into your blog post. Click on the Link button in the toolbar. In the Edit Link box, paste the URL in the Web address field. You may want to edit or delete the Text to display field. Hello, I think I've got it! Flats! :D Great project! I love the end result; the pyramid studs were the perfect choice. Thanks for participating in the craft-along! :-O so much that could be done for this! And only five nightshifts until I have some days off again and can start XD thank you for doing these challenges!